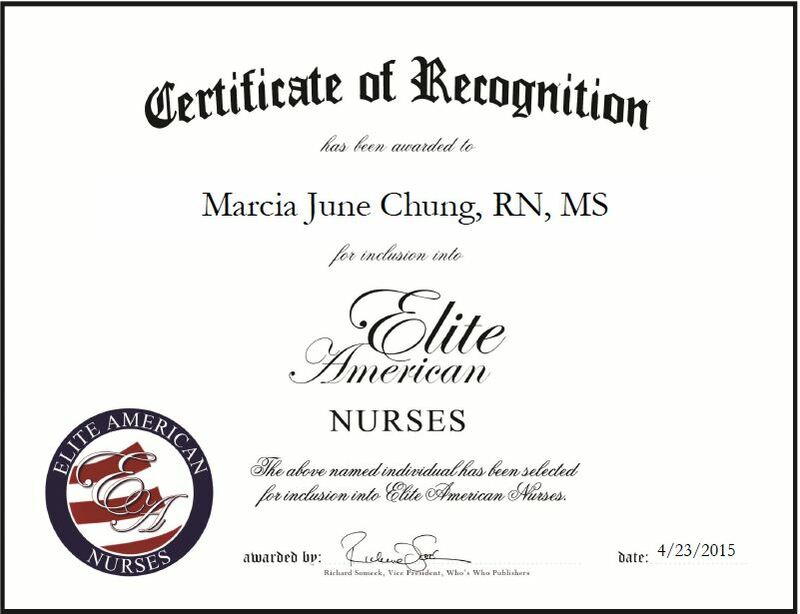 REDLANDS, CA, April 23, 2015, Marcia J. Chung, RN, MS, Owner of Halo Health, and Registered Nurse at Loma Linda University, has been recognized by Elite American Nurses for dedication, achievements, and leadership in health care education. As the owner of a premier marketing firm offering cutting-edge nutritional products, Ms. Chung lends her expertise in nutritional product education when consulting with others on anti-aging and weight loss methods. She instructs people on the proper use of such nutritional products as vitamins, dietary supplements, herbal products, and multivitamins. She also works with physicians, and performs glycoscientific research on the immune system and autoimmune diseases. In addition to the entrepreneurial role she takes on with Halo Health, Ms. Chung serves as a registered nurse at Loma Linda University, and treats patients, many of whom are experiencing problems with obesity. She offers them information on how they can successfully lose and manage their weight, and build muscle, enhance their immune system, and support their bone health. Ms. Chung holds a Master of Science in Health Sciences, which she obtained from the University of Oregon, and she remains abreast of trends and developments in her field as a member of the Professional Business Women’s Association and the American Nurses Association. This entry was posted in Health care education and tagged dietary supplements, entrepreneur, herbal products, nutrition, patient care, registered nurse, vitamins. Bookmark the permalink.